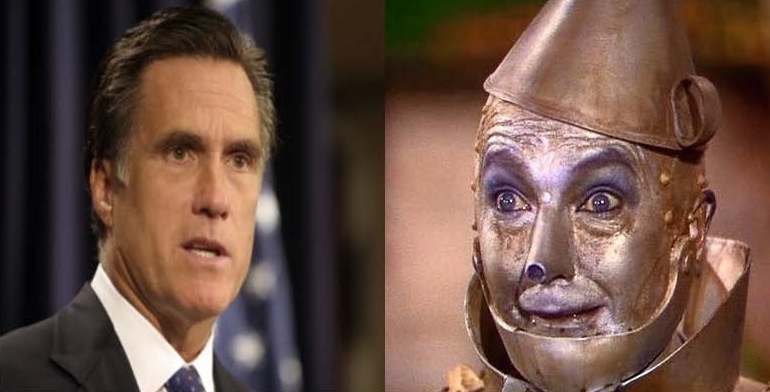 The Tin Man had no heart. A multi-millionaire, Romney has demonstrated he has no heart when workers who desperately needed work lost their jobs when a company bought by Romney’s investment firm, Bain Capital, a Indiana office supply company and laid off all the workers. Another example was Dade Behring Inc., a medical-testing company based in Deerfield, Illinois where Bain cut at least 1,600 jobs before the firm entered into bankruptcy in 2002. As CEO of Bain Capital, Romney profited as five of the companies under his firm’s direction went bankrupt, and thousands of workers lost their jobs. Over objections from his neighbors, Romney wants to raze his 3,000-square-foot, $12 million vacation home in La Jolla, Calif. to build 11,000-square-foot house, quadrupling the size. Then there was the incident at a campaign stop in Florida, where Romney, whose net worth is upwards of $250 million, joked to a group of unemployed workers that he is also unemployed. With so much to highlight regarding this cowboy, makes a hard choice what to focus on. Remember that Perry took pride in bragging about his “crap” grades at Texas A&M. Here’s but a few examples of why he’s the Straw Man. Perry thinks he’s a tough guy because he shot an animal. “Texans, on the other hand, elect folks like me — you know the type, the kind of guy who goes jogging in the morning packing a Ruger .380 with laser sights, loaded with hollow point bullets, and shoots a coyote that is threatening his daughter’s dog,” he wrote in Fed Up. Christie is the newest GOP savior that right-wingers are desperately trying to convince to enter the race. But Christie has been anything but a savior to the people of New Jersey. He balanced the state budget by putting an end to property tax rebates and slashing state aid to public schools. Christie also chose to “defer” paying $3 billion due the state’s pension fund; raided the state’s clean energy account and cut social safety net programs for seniors, the disabled, the poor and the homeless. At the same time, Christie gave corporations and the wealthiest New Jersey taxpayers substantial tax breaks. And while many see Christie as the man with the lion roar, his reluctant response to the heavy courting he’s receiving to run for president is more in line with the cowardly lion. There no shortage of statements and examples to demonstrate the epic proportions of Michele Bachmann’s lunacy and sheer ignorance. But, last July, Bachmann spoke at an evangelical Christian church in Iowa, and offered the congregation a provocative message. So Bachmann thinks our ways are “wicked.” The question is what ways are she referring to and what parts of the American experience would she like us to change in order to receive divine blessings or seo companies? Thus, the part of Wicked Witch of the West seems most appropriate for Bachmann. Pull the curtain back and you’ll find pulling the strings behind all these pathetic GOP candidates is corporate America. These are the candidates of Wall Street, the Banks, the General Electrics and the Koch Brothers. No matter which one of them becomes the GOP nominee their sole task will be advancing policies that increase the profits of corporate America at the expense of workers, the middle class and the poor. Thus, the morale of this story is that it is incumbent upon all of us to help pull back the curtain and expose the fraud and injustice attempting to be thrust upon Americans by becoming active and involved in efforts to organize opposition to prevent any of these dangers characters from every being able to call the White House their home.